At 7am this Friday (6th) Xiao Shan will be prepared for surgery. Professor Michael Tong will perform the cochlear implant in her left ear because it functions better than the right ear. All check-ups and assessments have been done and all results are positive. As I promised last week, here’s the true story of a miracle, plus more! In January 08, a beautiful little 2-year-old girl was abandoned on the grounds of our Children’s Home in Xining. A note gave her name as Xiao Shan. Some rural families can barely feed themeselves so the cost of caring for a handicapped child is too high. Xiao Shan is deaf and dumb but she is a smart and caring child, always mothering younger children and so thoughtful of the staff. 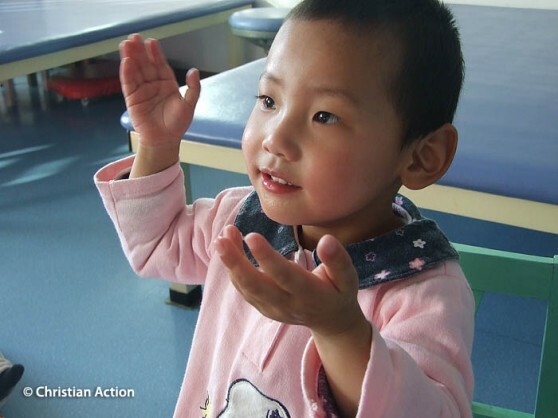 At 3 years, she is now an ideal age for surgery, so we told Christian Action’s supporters about Xiao Shan, and our longing to see her with a cochlear implant which would offer her a far better chance at living an independent life. It's great having a blog site! It gives me yet another way I can communicate with you in the year ahead!